Remember being terrified of the monster under the bed (or in the closet) when you were a child? I do. It’s a near-universal memory, and I’m watching my friends go through it with their children in turn. 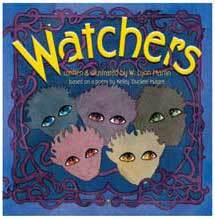 Watchers, written and illustrated by W. Lyon Martin (of Aidan’s First Full Moon Circle fame) is a charming story of one child’s brilliant plan to capture those monsters – and the discovery that not all is as it originally seems!